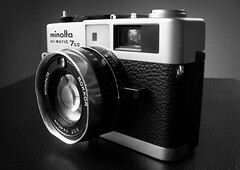 The Minolta HiMatic 7SII was a versatile 35mm, shutter-priority rangefinder camera. The camera is very similar in most respects to the Vivitar 35ES, Revue 400SE and Konica Auto S3, and is believed to have been built by Cosina for Minolta. The 7sII has a fast (f/1.7) 40mm, six-element lens that has garnered a reputation for extremely sharp and detailed images. Shutter speed: Auto 1/8~1/500 sec & Manual 1/8-1/500 sec & B. Film Range: ASA 25 to ASA 800. Also sold as the Revue 400SE and Vivitar 35ES.